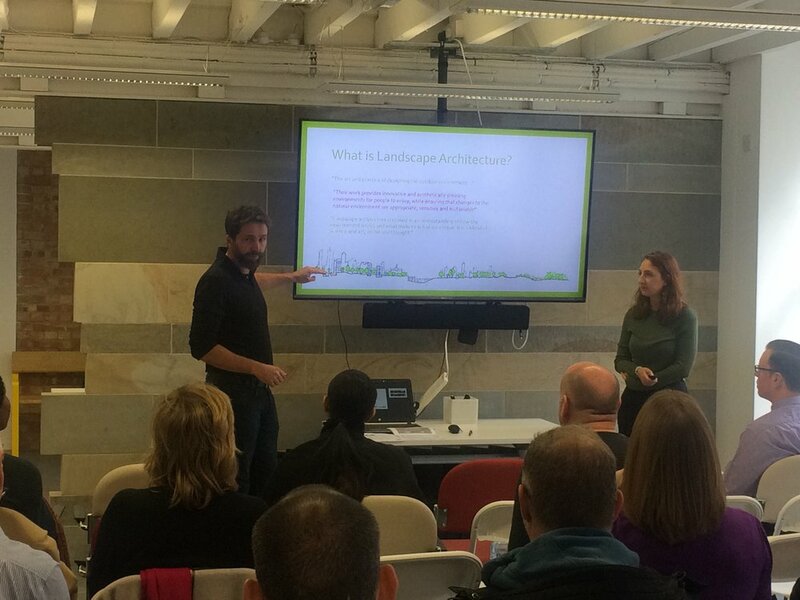 Today two members of staff, Hannah Murton (senior LA) and Sam Martin (director at ExA), presented a talk about the wonders of the landscape architecture profession in central London. The event was put on by the Central Careers Hub in conjunction with the Landscape Institute at the Marshalls Design Space in Clerkenwell and attended by 20+ secondary and tertiary education careers advisers. The talk was part of a series about the Built Environment, specifically about how to expose younger students to the profession, and to highlight different career paths they might take. Also on show was engineering, surveying and planning. Hannah explained her professional journey from the deep Shropshire countryside to Leeds Metropolitan University to study, and then through her career to Exterior Architecture here in London. Sam spoke about his path from rural New Zealand to sunny London and establishing Exterior Architecture along the way. It was a fantastic excuse for them to dig into why they love what they do so much, celebrate and shout about our wonderful industry, and to showcase some of their favourite landscapes. The talk was well received, and Sam and Hannah enjoyed the Q&A session with the attendees afterwards, explaining what they do and why it is important in today’s world. The journey that all landscape architect’s take is both varied and personal to everyone, which makes for a diverse and interesting profession. Landscape architecture is slowly becoming more understood and rightly given a higher profile in the arena of the built environment. The need for the younger generations to continue this trend is vital. Both Sam and Hannah are committed to furthering the appeal of the profession to younger generations, and this talk helped the career’s advisors to understand the profession. As a result of this latest presentation, both Hannah and Sam have been awarded the Ambassador for Landscape title from the Landscape Institute, showcasing their commitment to profession and the new generation of Landscape Architect’s to come.